HealthPostures will appear at the Minnesota Safety and Health Conference and Expo which will be held at the Minneapolis Convention Center. We sit at our desks typing, drawing and interacting with our computers. Our bodies were simply not designed to sit for that long. Workplace safety pioneer, HealthPostures, announces that it will appear at the Minnesota Safety and Health Conference and Expo which will be held at the Minneapolis Convention Center. HealthPostures is an early exhibitor at the May 3-5, 2016 conference, smartly getting in front of the huge draw that the conference and the downtown Paul McCartney concert are set to bring. 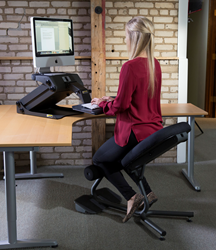 At a time when sitting for extended periods is gaining the reputation of being the new smoking, HealthPostures is building healthy workplace solutions like ergonomic sit/stand chairs, TaskMate assisted lift products and TaskMate Executive electric sit/stand desks. Aim of building the workplace safety solutions is to reduce the numbers of hours that workers sit. Inc. shares that "We sit at our desks typing, drawing and interacting with our computers. Our bodies were simply not designed to sit for that long." HealthPostures' designers get it. The products that they will bring to the Minnesota Safety and Health Conference and Expo improve workplace safety by increasing worker mobility, supporting the musculoskeletal system and improving worker engagement. Representing HealthPostures' at the conference will be a leader who understands ergonomics and the role that ergonomics fills in improving workplace safety at office and industrial facilities. Conference attendees will be able to interact with the HealthPostures' representative at any time until 2pm on May 3 and May 5, as the exhibitor hall will remain open during the day. Basic workplace safety certificates will be distributed at the conference. Tuesday's opening session is delivered by Connie Podesta who will speak on the topic, "Life Would Be Easy If It Weren't For Other People." Other conference sessions include "The Trust Edge" which will be presented by David Horsager and "Miracles Are Made" which is scheduled to be delivered by Deborah Hersman, President and CEO of the National Safety Council. Additional all day and half day sessions are to be held. Onsite training spotlights areas such as driver training, first aid training, traffic safety and safety products. Attendees can also learn about consulting opportunities on workplace safety that are offered through the Minnesota Safety Council. HealthPostures will also be on site to answer questions and demonstrate the functionality and flexibility of its workplace safety solutions. Founded in the 1990s, HealthPostures LLC (https://healthpostures.com) has been a leader in the workplace solutions space for more than two decades. The company specializes in the design and manufacturing of workplace solutions. Products that HealthPostures develops may help to relieve back and neck pain, headaches and other musculoskeletal disorders. A primary mission of HealthPostures' is to "strive to provide quality products that will help transform your sedentary life so you have a healthy way to work." Sought after ergonomics equipment, including sit stand products, that HealthPostures designs include surface Taskmates, the TaskMate Go Laptop, dual monitor sit stand work stations and Stance move seat extensions. The company's strong reputation and proven products and accessories continue to attract regional and national distributors and resellers.